Tomatoes: You're seeing heirloom (full share) and/or red slicing tomatoes (half shares) in your box this week. Our tomato crop will hit peak production in 2-3 weeks, at which point you'll see larger quantities of tomatoes that you may consider using to make salsa, sauce, or other tomato-heavy dishes. Enjoy these on a sandwich or with a slice of fresh mozzarella, a basil leaf, and sea salt. Keep the tomatoes on your counter ‒ some of them could use a day or two to finishing ripening up. One heirloom variety that was abundant this week is Cherokee Green; this one is ripe when the flesh is soft and the color is mostly green with some yellow/orange on the bottom 1/3 of the fruit. Don't mistake it for unripe! Other heirloom varieties in boxes this week are Cherokee Purple and German Johnson. Zucchini/summer squash: Just this evening, we just enjoyed some zucchini along with green pepper, a couple jalapeños, onion, basil, and tomatoes in an improvised ratatouille. Here's a link to a 2017 newsletter with a ratatouille recipe. It can definitely be made without the eggplant. Green bell pepper: Did you know that a green pepper is just a red (or orange or yellow) pepper that hasn't ripened yet? We plant certain varieties for primarily green pepper harvest, and others for primarily ripe harvest. You'll see some red bells soon from a “red” planting in our caterpillar tunnel. Basil: During tomato season, basil is a must-have around the kitchen. Julienne and pair with a tomato slice, add to ratatouille, or make some pesto. Basil is more sensitive to cold in storage than anything we grow, and will turn black from chilling injury. Keep in a plastic bag and above 40 degrees, if possible. Cucumbers: This would have been a good recipe for a couple weeks back, but you may still want to try this boldly flavored Asian cucumber salad. Fresh yellow onions: It'll be 2-3 weeks until our yellow onions are cured and ready to store. These are straight out of the ground (with a little trimming and cleaning) and should be stored in the fridge, not the cupboard. Use these in any cooked meal calling for onions. Cauliflower (Rotational ‒ half shares only): Spring-planted cauliflower has always been a tough one for us ‒ the high summer sun and long days tend to cause pigmentation in the curd. So we decided to try out an orange variety of cauliflower that's designed to be pigmented. This variety is called, 'Flame Star.' The flavor is similar to standard white cauliflower. We are harvesting them on the small side, as quality has been declining when we wait until they get large. Green beans (Rotational ‒ full shares only): We love these beans steamed and topped with some olive oil, sea salt, sliced almonds, and freshly grated Parmesan. Carrots: Use in this week's recipe! Each week, we’ll give some hints about what new items may show up CSA shares in the next 1 -2 weeks. Please note, this is not a guarantee, but our attempt to give you an idea of what’s coming up. We did our first harvest, about 1600 lbs, on our largest crop: Anaheim peppers. This creates a big spike in our labor needs on the farm, since none of our existing weekly CSA/market activities have slowed at all. The key to making this work for us has been to bring in a crew that works on a contract basis. The leader of that crew, Houa, stands proudly by one of the four 20-bushel bins of Anaheims her crew harvested this past Monday. We will continue weekly harvests of the dozen or so hot pepper varieties we grow exclusively for these two companies into early October. Other signs of peak summer? Tomatoes harvests are picking up, melons have set fruit and are on their way to ripening, and our small amount of sweet corn, if it can be protected from racoons, is almost ready. Each week, we have about a day and a half during which the crew can take on farm projects that aren't harvest and washing produce for CSA and farmers' markets. This week, the name of the game is bulk allium (onions and garlic) harvest. From what I've been seeing, it's looking to be a good crop this year. 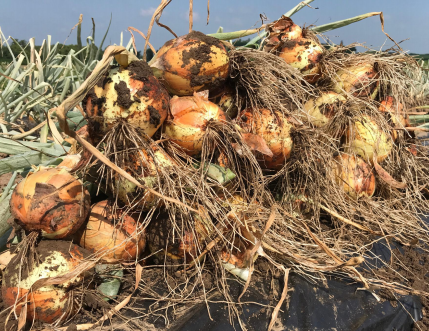 We used our new “undercutter”‒ a tractor-mounted implement that drags horizontally oriented blunt blades through the soil ‒ to accomplish two tasks at once: loosen the onions and lift them out the soil while doing the same thing to the plastic mulch on which the onions were grown. This way, as soon as we get the onions out of the field, we can also remove the mulch and get a cover crop established. Look for cured onions and garlic in your boxes in 2-3 weeks! Source Note: Berbere is an Ethiopian spice blend that is a key ingredient in many Ethiopian and Eritrean dishes. Not for the faint of heart, this spicy mixture usually includes chile peppers, garlic, ginger, basil, korarima, rue, ajwain or radhuni, nigella, and fenugreek. You can either make your own (good recipes exist on the Internet) or you can buy it online from specialty food retailers. 1. Heat 1 tablespoon of the oil in a large nonstick frying pan. Add the mustard and cumin seeds. Fry until the mustard seeds start to pop. Add the carrot and stir. Let the carrot “sweat” for 10 minutes. 2. In a separate pan, sauté the garlic, ginger, jalapeño, and turmeric in the remaining 1 tablespoon oil for 3 minutes, add a little berbere and salt, then mix everything with the carrots. 3. Add the stock, lentils, and more berbere; then simmer for 30 minutes. Add more stock if the pan starts to get too dry. 4. Add the peanut butter, curry powder, salt, and pepper. Simmer until the lentils are cooked through (they’ll break down a little) and the soup is a thick consistency. Right before serving, add the ½ cup chopped cilantro and stir to combine. 5. Serve the soup in individual bowls, garnishing each with the yogurt, chopped cilantro, and cilantro sprigs. Serve with rice, naan, or pita bread.